Weighty Matters: Book Review: Alex Hutchinson's Which Comes First, Cardio or Weights? 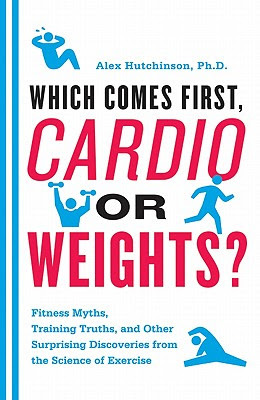 Book Review: Alex Hutchinson's Which Comes First, Cardio or Weights? For those of you who don't know, Alex is a columnist for the Globe and Mail. More importantly, he's an evidence-based journalist with a penchant for exercise. His book, Which Came First, Cardio or Weights? is his mythbusting exploration of the science behind fitness. What I loved most about the book was that it busted myths that had pestered me for years. I learned not to worry too much about trying to time my breathing while running, but just to let nature take care of itself, that my body will adjust to running on pavement such that my knees will get pretty much the same beating as softer ground (which by the way, according to a quick Twitter communication with Alex means that you don't need to buy new running shoes unless the wear on the soles are uneven), that personal trainers actually demonstrably and significantly improve performance and muscle gains, and that the optimal post workout dose of protein is about 20g consumed within an hour of finishing. The book's broken down into chapters that deal with various sports and sport related issues. Gear, physiology, aerobic exercise, strength and power, flexibility and cores, injuries and recovery, exercise and aging, weight management, nutrition and hydration, mind and body and the competitive edge. If you're like me with brief little pockets of reading time, each chapter is then subdivided into quick, digestible nuggets, and if you're really not into reading, ends with a handy, dandy point form summary of all the evidence-based pearls with none of the back story. This book is a really should have for individuals with even a moderate interest in fitness. This book is an absolutely must have you're doing your clients a disservice if you don't, for every personal trainer on the planet.